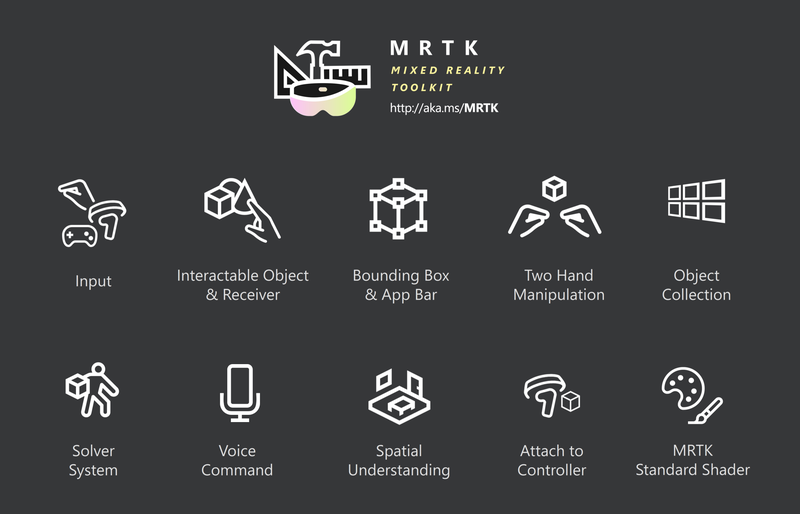 Learn about the latest building blocks in MRTK(Mixed Reality Toolkit) for creating apps for HoloLens and immersive headsets. IMPORTANT: This article is about MRTK v1(also known as HoloToolkit). MRTK v2 is NOT compatible with MRTK v1(HoloToolkit). However, most of the building blocks have been ported over MRTK v2. Please see the new documentation portal for more details about new building blocks in MRTK v2. Whether you are creating apps for HoloLens or immersive headset, you need to set up your scene with proper input module, camera, cursor or motion controllers to interact with your content. And Mixed Reality Toolkit makes it easy. When you first start creating apps for mixed reality, these two example scenes are the perfect place to start with. Through these scenes, you can learn how to use MRTK’s InputManager and access data handle events from the motion controller buttons. 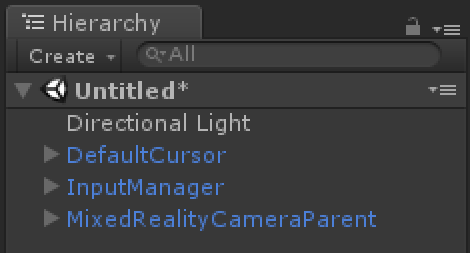 When you import MRTK release Unity packages or clone the project from the GitHub repository, you are going to find a new menu ‘Mixed Reality Toolkit’ in Unity. Under ‘Configure’ menu, you will see the menu ‘Apply Mixed Reality Scene Settings’. When you click it, it removes the default camera and adds foundational components — InputManager, MixedRealityCameraParent, and DefaultCursor. You can also manually add these from the project panel. You can find these components as prefabs. When you search MixedRealityCamera, you will be able to see two different camera prefabs. The difference is, MixedRealityCamera is the camera only prefab whereas, MixedRealityCameraParent includes additional components for the immersive headsets such as Teleportation, Motion Controller and, Boundary. MixedRealtyCamera supports both HoloLens and immersive headset. It detects the device type and optimizes the properties such as clear flags and Skybox. Below you can find some of the useful properties you can customize such as custom Cursor, Motion Controller models, and Floor. Interactable Object examples show how to make any object interactable and make it respond to standard input states such as observation, targeted and pressed. In mixed reality, a button could be anything from a coffee cup to a balloon, it doesn’t have to be a flat rectangular shape that we have been using in 2D screens. It is important to provide clear visual feedback so that people can understand which object is interactable. To make an object interactable, you can use series of the scripts called CompoundButton. They are modular scripts for various interaction elements such as mesh, text, animation, icon, sound, and speech. You can mix & match these scripts for your purpose. InteractableObjectExample.unity scene includes HolographicButton prefab and ToolBar prefab made with HolographicButton + ObjectCollection. Interaction Receiver is a convenient building block that allows you handle the events from multiple objects in a single place. As you can see in this diagram, Interaction Receiver can store list of the objects and when it receives events, it can do something based on the triggered object. 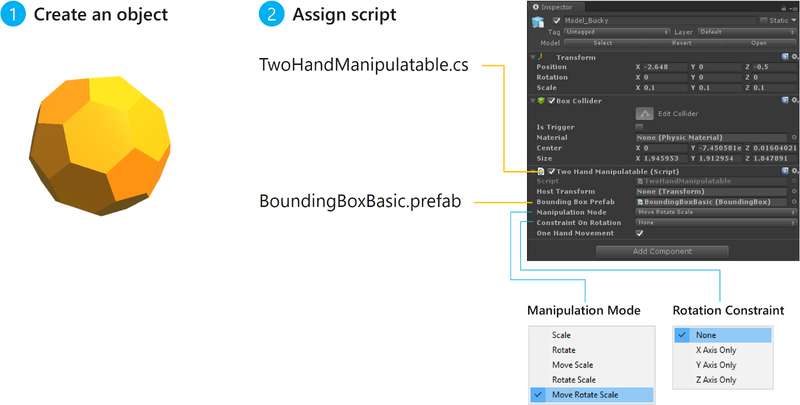 Bounding box is the standard interface for manipulating objects in Windows Mixed Reality. You can find this in the HoloLens shell as well as the cliff house in the immersive headset. With this single UI, you can move, rotate and scale objects. App bar is used to display contextual buttons on the objects. In default, it shows Hide, Adjust, and Remove button. Adjust button shows the gizmo affordance for manipulation and remove button deletes the object. You can also add additional custom buttons in the AppBar prefab. Simply assign BoundingBoxRig script to any object. BoundingBoxBasic prefab is required to get blue wire visualization. TwoHandManipulatable script is optional. This allows you move, rotate, and scale using two hands. In default, Bounding Box does not move the object. You can also add your custom buttons to the AppBar. 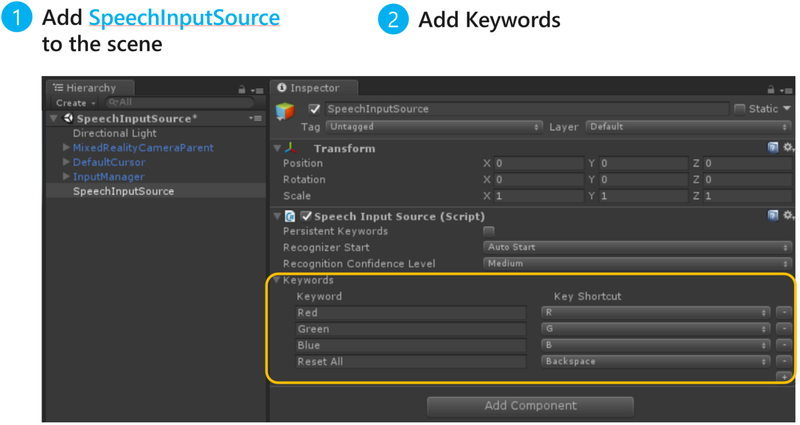 Search AppBar prefab in the project panel and find Button property in the Inspector panel. You will be able to adjust the number of Buttons and define your custom buttons. Two Hand Manipulation allows you manipulate objects using both hands. You can scale, rotate and move by tap and hold and moving your both hands. 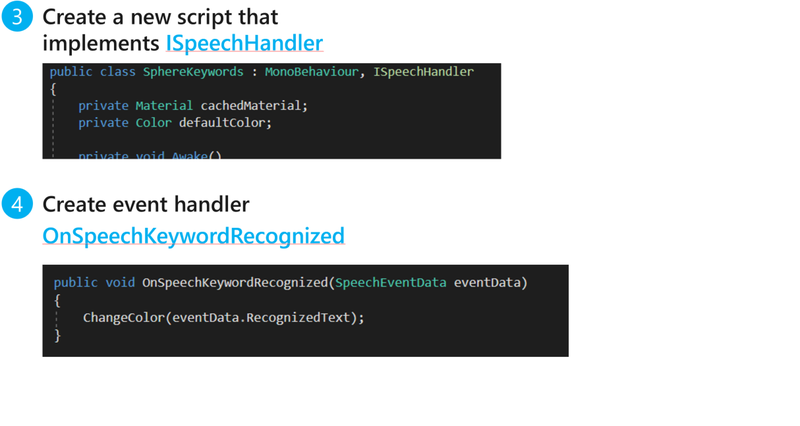 This is the same interaction behavior introduced in April 2018 Update (also known as RS4) HoloLens as well as in the cliff house for the immersive headset. It works with motion controllers too. It is an intuitive way to manipulate the objects in space. Simply assign TwoHandManipulatable script to any object. With Object Collection, you can easily layout an array of objects in 3D space. You can specify the surface type, row, radius, cell width/height and facing options. With these various options, you can quickly construct three-dimensional grid system. Example of making a grid layout UI with HolographicButton prefab and ObjectCollection. Solver system allows you to combine various object positioning behaviors and run them in order. The Start menu is a good example that shows multiple behaviors such as Tag-along, Surface Magnetism, and Constant View Size. It follows you in a certain range and if it collides with other object surfaces, it follows the surface and automatically scales down or up to maintain the size. In MRTK, there is a simple Tag-along script but Solvers could be better when you want to combine multiple positioning mechanisms such as Tag-along and Surface magnetism. Voice input is a natural way to interact with an object in mixed reality. It can help users to reduce the time and minimize effort. Windows Mixed Reality shell provides system level commands such as “Select”, “Close”, “Move This” and “Face Me”. With MRTK, you can easily add voice commands to your experiences. Spatial Understanding is one of the most exciting capabilities in HoloLens. With Spatial Understanding, you can analyze your environment and identify the types of physical surfaces — such as Floor, Ceiling, Wall, and Platforms. When you leverage these physical surfaces, you can create realistic holograms that interact with the real-life environment. In MRTK, there are three different examples. Spatial Mapping, Spatial Processing, and Spatial Understanding. You can simply drag and drop SpatialMapping prefab and you can get this kind of meshes of your environment. It is a little bit rough but it is a quick and easy way to make your app interact with the environment. If you want to get more refined clean surfaces, you can use Spatial Processing. Spatial Processing converts the meshes into planes by merging vertices. Through this, you can get clean planes for the walls, tables, and floors. This is the most sophisticated one. The example scene shows the room scanning experience and gives you identified surfaces. Using this technique, you can place your content on a specific surface type. If you build an experience for the immersive headset with motion controllers, you can use AttachToController to attach any objects and UI to the controllers. You can find great examples in the Mixed Reality Academy Tutorial — Motion Controllers. MRTK/StandardShader is a new shader which provides various kinds of effects such as glowing border, hover highlighting, and animated properties. With this shader, you can easily achieve Fluent Design System’s elements such as light, depth, and material. It is optimized for the performance in HoloLens to run at 60fps. You can find great examples of the materials based on MRTK/Standard Shader. I introduced some of the useful building blocks in MRTK. I hope this can help your mixed reality journey! Join the community by opening an issue, reporting a bug, and contributing your code!